Not only pet urine smells bad, but it can also pose serious health hazards. Online DIY solutions may be a quick fix. However, only a professional carpet cleaning company can completely diminish residues and smell of pet urine. Otherwise, long exposure to pet odor can cause different types of health risks you’ve never even thought before. 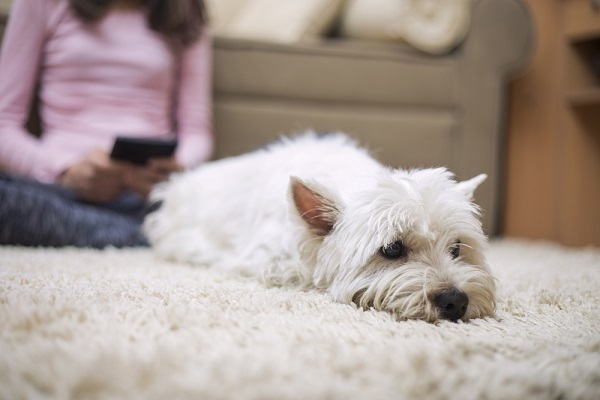 Here are some of the dangers residual animal urine in your carpet can bring. Your cats’ or dogs’ urine is highly concentrated and smells sharply of ammonia. Ammonia fumes are irritating to the nose, throat, and lungs. When your pet urinates in a reduced ventilation such as your home, the air present can trigger asthma, pneumonia, and even suffocation. Ammonia inhalation can cause olfactory adaptation and fatigue. Cough phlegm and shortness of breath because of the irritation in the airways of the lungs makes it difficult for someone to breathe normally. It is also an indication of respiratory infection. Low concentration of ammonia can cause rapid eye and skin irritation. On the other hand, prolonged exposure can lead to a permanent eye damage, or even blindness, and also skin burns. Children are also more susceptible to this risk because of their lower body weight than adults. It may not seem so serious since your pet is too adorable to discharge a hazardous odor. But since it is very dangerous to your health, you want to keep your carpet clean not only to look good but also to feel good. Hire a professional carpet cleaning company so that you can avoid these health risks brought by pet urine in your carpet.